As usual there will be foals available by our senior stallion, Eyarth Beau Geste, who celebrated his 21st birthday in 2018. 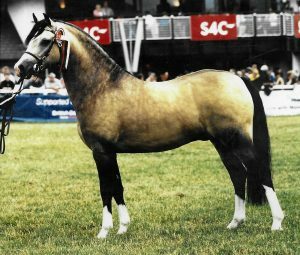 His last appearance in the show ring came as a three year old (pictured above) when he was Youngstock Champion at the Royal Welsh Show. Since then he has gone on to sire a host of winners at this prestigious event including in 2017 when his offspring took the Overall Section B Championship (Waxwing Penny Gold) as well as the Reserve Youngstock Championship (Waxwing Glamour). In 2018 Glamour returned to the Royal Welsh taking the Youngstock Championship, Champion Female Championship and Reserve Overall. 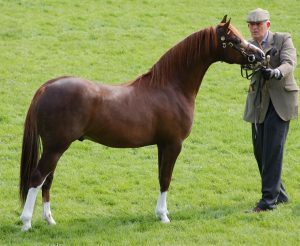 Masquerade continues to cross very well on our Beau Geste mares with progeny winning at major shows both in hand and under saddle. In 2018 Waxwing Razzle Dazzle and Waxwing Aristocrat came first and second respectively at the Royal Welsh. Waxwing Archive and Waxwing Arco were leading novices with Arco taking the prestigious Picton Novice Championship at the NPS Summer Championships. This year we will have three outstanding three year olds for sale which show the potential to go far in the ridden world.